Greetings ... in the day of Venus ... the Venus-day with the Orange fragrance of the Lovers, the Family and the friends. who played the role of 'Francis Bacon' ... like the son of Bacon Family, because that was the place where the Queen Elizabeth I, the very daughter of King Henry VIII, place him ... when he was a baby. And in a Dark World ... decaying World ... The Light and the Love is immediately recognized. Colombo explains ... 'Neither reason nor mathematics nor maps were of any use to me: fully accomplished were the words of Isaiah'. 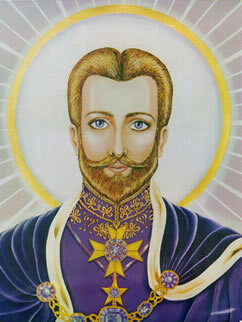 In fact like explained previously ... Saint Germain was also Christ-opher Colon-bo. (Christ go to Colonize). I want you please note that ... Francis Bacon was 1st Viscount St Alban. Coincidence? ... There are no coincidence. The Shakespearean play that comment 'Saint Alban' is the The Second Part of Henry the Sixth. --The Second Part of Henry the Sixth. Saint Alban was a Martyr ... like Bacon. He is also commented in the book Life of St Germanus of Auxerre. Another Coincidence? ... No. 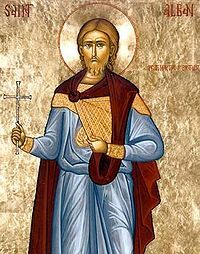 Saint Alban was Christian priest. 'Bede tells several legends associated with the story of Alban's execution. On his way to the execution, Alban had to cross a river, and finding the bridge full of people, he made the waters part and crossed over on dry land. And the executioner was so impressed with Alban's faith that he also converted to Christianity on the spot, and refused to kill him. Another executioner was quickly found (whose eyes dropped out of his head when he did the deed), and the first was killed after Alban, thereby becoming the second British Christian martyr. Therefore Saint Alban was like Moses ... and this story of Saints connected with Water is common ... like for Saint Francis or Saint Francis of Paula. If a Saint say a Word ... and it don't have been realized ... It will become true in short time.